Lewis Hamilton is in the best possible position to march to his third successive British Grand Prix victory after topping both free practice sessions at Silverstone on Friday. His Mercedes car proved unbeatable around the cool and windy English circuit with a fastest lap of 1:31.660, his margin over the next-best car — Nico Hülkenberg’s Force India — all of 0.8 seconds in the opening practice session. 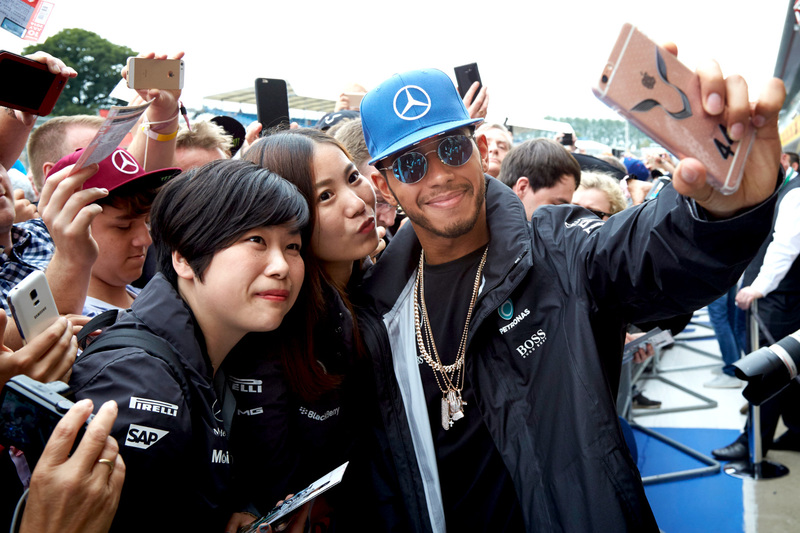 A win would make Hamilton the most successful British driver at Silverstone and equal second most successful at a British Grand Prix held at any of the three circuits to have hosted the event. The Briton’s teammate and 2016 championship leader, Nico Rosberg, provided some consolation for the spread of the field by setting a time within 0.033 seconds of the benchmark, but his hopes for upsetting the home crowd were dealt a blow when his car encountered problems on start-up at the beginning of free practice two. The team thought it found the cause of the problem and asked the German to get back into the car, but before he could so much as leave the garage his mechanics detected yet more problems, leaving Rosberg to sit out the session entirely. Red Bull Racing, which was more than one second off the pace in the opening practice session, improved to lap within 0.391 seconds in the afternoon session courtesy of Daniel Ricciardo, but even his afternoon was soured when his car developed what appeared to be a gearbox problem at the end of the 90 minutes. Ricciardo’s teammate Max Verstappen was almost 0.3 seconds further behind, but the Austrian-owned team is nonetheless shaping up to be the most competent challenger to the dominance of the Mercedes cars thanks to its effective Adrian Newey-designed aerodynamics package around the aerodynamics-dependent track. The best Sebastian Vettel could manage was a lap almost one second adrift of the pace. The Ferrari driver encountered a gearbox problem in the first practice session, but no such issue appeared to hamper his progress in the afternoon. Kimi Räikkönen, newly re-signed to the Ferrari team for 2017, followed closely behind his teammate, while Fernando Alonso and Jenson Button put their McLaren cars in sixth and ninth. Honda has brought an upgraded power unit to the British Grand Prix, spending two development tokens to tweak the internal combustion engine — and after Jenson Button’s sixth-place finish in Austria last weekend, the once-great McLaren-Honda team has its sights set higher in England. The fastest Williams could manage was seventh and tenth at the hands of Valtteri Bottas and Felipe Massa, but Romain Grosjean’s eighth-fastest time in his Haas car belied what appeared to be good long-run pace and tyre endurance, putting his team at a potential advantage around the high energy, high tyre load circuit. One hour of practice remains on Saturday morning before the 22 cars qualify for Sunday’s 2016 British Grand Prix at 1PM local time.